Today is September 21, 2011. Today is a very special day. Thirty-one years ago today, my sister was born. Twenty-four years ago today, my sister was not a very happy camper because her birthday gift was… drumroll please… me! When we were younger, Vanessa and I fought all the time. I mean all-of-the-time. I thought she was the greatest thing since sliced bread and she loathed my existence. Note to any parents to be: don’t wait seven years to have a second child. It’s just cruel. But alas, as time has gone on, Vanessa has become my closest friend and one of the few people in life I can trust unconditionally. No one, and I mean no one, can take the place of a sister, and if you have a sister, then you know this to be true. If you don’t have a sister, well, I’m sorry. You will never quite comprehend the bond, the friendship and the love that one can bring. Happy birthday big sis! I made your favorite. 1. Preheat oven to 350 degrees, and grease a 10 inch Bundt pan. Make sure to have all ingredients at room temperature. 2. In a large bowl, stir together cake mix and pudding mix until well combined. Make a well in the center of the powders and pour in eggs, sour cream, oil and water. Beat on low speed until blended. Scrape bowl, and beat 4 minutes on medium speed. Stir in peanut butter chips until well incorporated. Pour batter into prepared pan and bake in the preheated oven for 50 to 60 minutes, or until a toothpick inserted into the center of the cake comes out clean. Allow to cool before glazing. 1. Stir together the water, sugar, and peanut butter until smooth. Drizzle over cooled cake and serve. Happy Birthday to both of you :) You had me at peanut butter. Then again at chocolate, then brownie, then bundt. Ahhhhhmaaaazing! Pretty wild that they are years apart but the exact same day-Happy birthday to you both. That cake looks like an excellent way to celebrate. 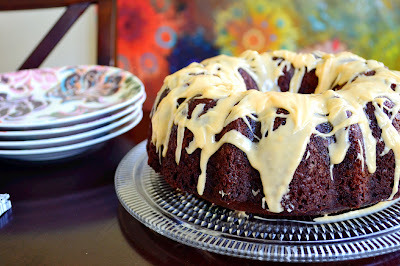 Lots of delicious ingredients in that bundt cake! Yes please! I'll take the whole thing! YES PLEASE!!! Peanut butter brownie cake?!! Where do I sign up for a fork? Happy Birthday to your sweet sister! What a great cake to celebrate with. Thank you for making me smile. I love visiting your blog before I head to work. It is a great start to my long day. Much love and many blessings from Austin! I need to use my bundt pan again or the baby ones. I wish I had a sister to make this for me! !